Dhaka, Jan 26 (Just News): BNP senior leader Gayeshwar Chandra Roy on Friday warned that the consequence will be very 'bad' if the court gives any negative verdict on the Zia Charitable graft case filed against their chairperson Begum Khaleda Zia. "I think the foundation stone for the fall of the government will get set up if any negative verdict is pronounced by the court at the behest of it (govt) on February 8," he said. 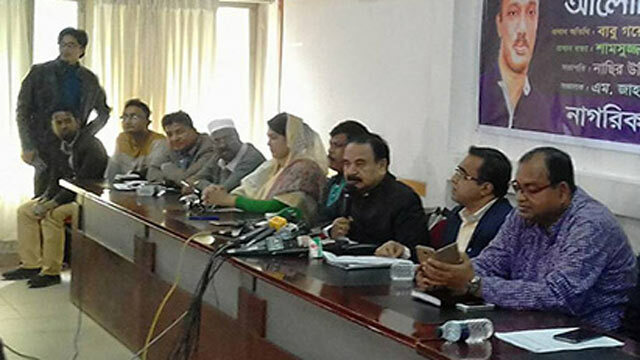 Speaking at a discussion, the BNP leader also said a disastrous situation may be created in the country if Khaleda is convicted, no matterwhether BNP announces any formal action programme or not. Nagorik Odhikar Andolon, a pro-BNP platform, arranged the programme at the Jatiya Press Club, marking the third death anniversary of Arafat Rahman Koko, the younger son of BNP founder Ziaur Rahman." On Thursday, the Special Court-5 in Dhaka fixed February 8 to deliver verdict on the Zia Orphanage Trust graft case against Khaleda and 5 others. On August 8, 2011, the commission filed the Zia Charitable Trust graft case with Tejgaon Police Station accusing four people, including Khaleda Zia, of abusing power in raising funds for the trust from unknown sources. Khaleda will be disqualified for the next general election if she is convicted in the case. Gayeshwar, a BNP standing committee member, said people will come up with a befitting reply if the government tries to take political revenge on Khaleda using the court. He alleged that Awami League is making various plots to keep their party away from the next polls as the ruling party has no ability to contest against BNP. About the schedule for the presidential election, he said though the President's post is very important, people have no interest in the polls as the President has no power to play any role during the country's crisis.